The 13th edition of the ceremony for awarding some of the most prestigious awards in the field of sustainable development – the “Largest Corporate Donor” of the Bulgarian Donors’ Forum, took place on November 22 in Sofia. The host of the ceremony was traditionally the President of the Republic of Bulgaria, Rumen Radev. The prizes are awarded according to the financial and non-financial investments of the companies during 2017, as well as for voluntary work done by their employees. ContourGlobal Maritsa East 3 was declared a winner in the category “Non-financial Donations“. ContourGlobal Maritsa East 3 won the prize in the race with numerous prominent companies with large-scale programs for social investments, realizing in 2017 donations totaling BGN 814,488. President Rumen Radev opened the ceremony with the following words: It is important to give an example to young people. You have to give heart, hope, ideas, work and make society more sympathetic to the idea of a better Bulgaria. The state, businesses and citizens have common goals and work together to have a Bulgaria in which our children want to learn and stay in. “On behalf of the entire team of ContourGlobal Maritsa East 3, I cordially thank for this valuable prize for this recognition of our belonging to the responsible companies, including the ones presented at today’s event, said Krasimir Nenov, CEO of the company. ContourGlobal Maritsa East 3 was awarded for making non-financial donation totaling BGN 814,488 in 2017. ContourGlobal Maritsa East 3 stands behind this cause for another year together with the Municipal Organization for the Disadvantaged People in Galabovo and Galabovo Municipality to support the unique sporting event “Sports Games for People with disabilities”. The games are held in the Energetik sports hall that was renovated by the company in the town of Galabovo. It is equipped according to all sporting standards. The unobstructed accessibility for people with disabilities provided by the reconstruction provided nearly 100 participants from the entire country, aged between 14 and 70 the exclusive opportunity to be active in a way accessible to them, to socialize and to celebrate the strength of their sporting spirit. An example of successful social synergy is the joint project of ContourGlobal Maritza East 3 with the Municipality of Stara Zagora and the non-governmental organization Civil Society Alternative 55 – the application for a specialized communication system Assist. The essence of the project includes providing innovative computer management equipment and conducting a series of trainings on how to use it with specialists providing social services to children with disabilities and their parents. The so-called “Contact-to-Speech System” (ASIST) assists communication, training and development of children with generalized developmental disorders, thus helping to improve their lives and their inclusion in society. ContourGlobal Maritsa East 3 donated a contemporary AST 500 cryostat to the Complex Oncology Center in Stara Zagora. The new, fully automatic device provides fast and reliable pathological results during the operation itself, which is critical to the patient’s proper treatment. The complex oncology center Stara Zagora is the only treatment facility of this type in the region and serves the population of four districts – Stara Zagora, Sliven, Haskovo and Kardzhali. ContourGlobal Maritsa East 3 made a present to the Zahariy Knyazheski Regional Library. The institution received over 190 titles by famous foreign and Bulgarian authors for its library fund and an annual subscription for five specialized editions in the field of energy, mining, as well as three computer configurations and a modern scanner for the reading room of the library. The newly built park Ezeroto worth BGN 650 000 offers the residents and guests of the town of Galabovo places for relaxation meters away from the coolness of the Rozov kladenets dam. 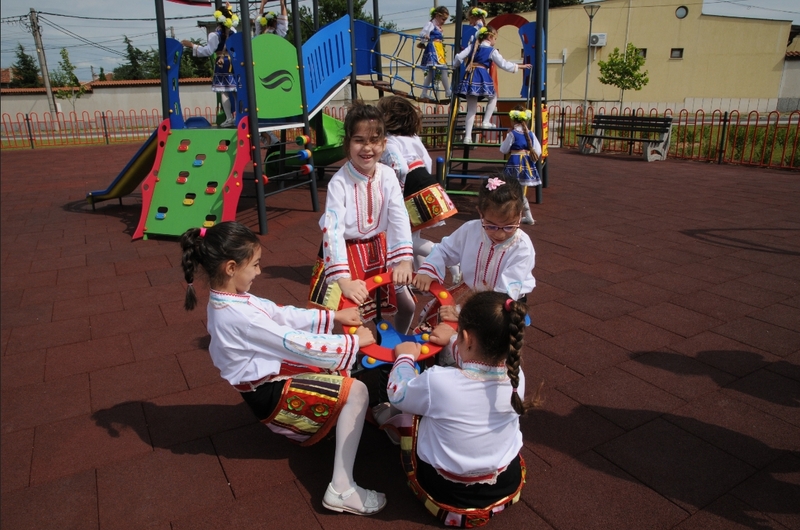 The project, developed jointly by the teams of the Municipality of Galabovo and ContourGlobal Maritsa East 3, is fully in line with the needs of the locals and includes a secured football field with specialized flooring, a sandbox for beach sports, a fully equipped fitness area, a children’s playground, a fountain and wooden arbors.